Home Features What Have the Blues Learned From the Parc Des Princes? What Have the Blues Learned From the Parc Des Princes? On Wednesday night, the Champions League returns with Paris Saint-Germain travelling to Stamford Bridge looking avenge last season’s defeat at the hands of Chelsea and book their place in the quarterfinals. It was last season that PSG fell at the quarterfinal stage at the hands of the Blues, losing 2-0 in London and losing the tie to a late goal from Demba Ba. However, last season, the Paris side were in a much better position heading into this match, having won 3-1 in the first leg at the Parc Des Princes. This season, PSG head to Stamford Bridge with honours even at 1 goal apiece, though Chelsea have the advantage via away goals. It means that the task facing Blanc’s side is a much more difficult one, as his side will need to find a goal if they have a chance to progress in the competition. Laurent Blanc must make some slight changes to his approach. Coming into Wednesday’s match, Laurent Blanc is a manager on the hot seat. Reports say that Blanc must show progression in the Champions League in order to keep his bosses happy and avoid the sack, and that means guiding this PSG team to the quarterfinals of the competition, which is something that hasn’t happened yet. With Blanc under pressure, it will be interesting to see how he sets up his side in order to win this tie, especially since he basically has his full squad available to him, although both Lucas Moura and Serge Aurier will miss out due to injury. 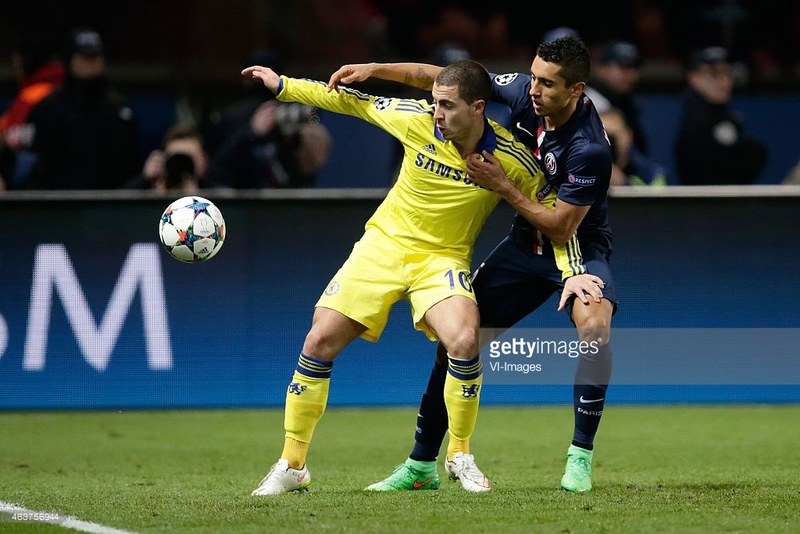 The one thing that PSG must not do is give too much respect to Chelsea’s ability to counterattack. The temptation with a 1-1 score line away from home is to sit deeper, defend very solidly, and hope that you draw your opponents out just enough to nick a goal and win the tie. If the first leg taught us anything, it’s that PSG can defend in numbers and make themselves hard to beat, but when they adopt that approach, their ability to counterattack isn’t there unless they can free Etienne Capoue, who was the only PSG player in the midfield who showed the ability to threaten in transition. When PSG switched tactics and started to play a bit more, they completely controlled the match and probably should have won the first leg. For PSG to win, I think they have to start the second leg the way they finished the first leg. Because they have to score at least one goal, and two goals puts them in commanding position, I think PSG have to take a risk and attack, especially since conceding a goal to the Blues doesn’t really change their situation. PSG have a big call as to how they set up in midfield and defence. With PSG having nearly their entire first-team squad fit, with the exception of Lucas Moura and Serge Aurier, Blanc has an opportunity to play what seems to be his first-choice 11, restoring Thiago Motta to his place as the holding midfielder and moving David Luiz back into defence to partner Thiago Silva. While that might be his first choice 11, you do wonder if that’s the correct approach against this Chelsea side, particularly given the knock-on effects of playing that way. In the build-up to Wednesday’s match, there has been some talk of Blanc playing an all-Brazilian back four, moving Marquinhos over to right back, partnering Silva and Luiz, and playing Maxwell at left back. For me, that would be a dangerous game to play, particularly because Marquinhos isn’t really a right back. While athletically gifted, he’s not great defending one-on-one and isn’t a real attacking threat down their right side. Against Eden Hazard, that’s dangerous because given time, space, and freedom, he’s the one player in the Chelsea side that you cannot let beat you one-on-one. The second option is to play Gregory van der Wiel at right back, who played well in the first leg, and have a dedicated attack-minded full back. Van der Wiel was immense in the first leg, and I think he was part of the reason that PSG had such success in the second half. Every time van der Wiel came forward, he looked a real threat to create something down the right to the point that around the 30th minute, Hazard actually swapped flanks with Willian because he was causing him problems. Playing van der Wiel in tandem with Luiz playing in midfield stymied the Chelsea counterattack. Van der Wiel’s threat kept Hazard from playing more of a free role to initiate counterattacks with his pace, and it led to PSG being on top for much of the second half. However, should you play van der Wiel with Luiz at center back, PSG will carry more of an attacking threat, but will also leave Thiago Silva exposed to Diego Costa when Luiz eventually steps further forward, as he inevitably will do, because van der Wiel won’t be in position to help out defending. It’s a conundrum that Blanc faces when trying to figure out how to attack this Chelsea side, especially because it’s pretty clear what Jose Mourinho will do. Edinson Cavani and Zlatan Ibrahimovic can’t play together up front, except when they can. This will be a fascinating thing to watch in this match, because I think PSG stumbled upon a way to play Ibrahimovic and Cavani in the same side and have both be effective. It’s clear that the focal point of the attack is Ibrahimovic, and that will not change as long as he’s fit and firing. Unfortunately for Chelsea, the injuries that he was recovering from before the first meeting are well in the past, and Ibrahimovic is starting to play like he did last season. The problem for PSG has always been that Ibrahimovic is such a commanding presence that it makes it hard to play anyone alongside him as a partner, especially when that player has a commanding presence as well, like Cavani. To accommodate Ibrahimovic, Cavani’s often been played out wide to allow Ibrahimovic to be at his best, and I think Cavani’s performances have suffered because of that position change. However, in the second half against Chelsea, something interesting happened. Because van der Wiel and Maxwell were essentially pushing Willian and Hazard back, Cavani and Ezequiel Lavezzi didn’t have to worry about keeping the width like normal wide players would. The fullbacks were providing that width, so Cavani and Lavezzi started coming inside playing rather free roles. Cavani then began finding success making runs through the channels off of Ibrahimovic, with Lavezzi playing a bit deeper and looking to run at the defence. It resembled somewhat of a diamond in midfield, which was perfect because it allowed Marco Verratti the space he needed to dictate play. That’s something that Chelsea need to be aware of, particularly now that Javier Pastore is fit for this match. Pastore missed the first leg due to injury, and similar to Lavezzi, likes to come inside. The difference is that Pastore is much better at creating chances than Lavezzi, and that can be dangerous for Chelsea, depending on how the Blues put their midfield together. Jose Mourinho must decide on what he wants from his midfield, particularly how to deploy Cesc Fabregas. Chelsea have a bit of a problem in terms of midfield balance depending on who plays. The biggest problem for the Chelsea midfield, ironically, is probably the one player who is capable of dictating the tempo of the match from that midfield position and who leads the team in assists, Cesc Fabregas. Skill-wise, it’s hard to leave Fabregas out of the team because of his ability to control the tempo of the match. There isn’t another player in this Chelsea team that can do that when he’s given the space to do so. Tactically, Fabregas provides a problem to the side, because of his limitations positionally. Chelsea have looked at their best in attack when Fabregas is deployed deeper and Oscar is in that number 10 role because Oscar’s willingness to make runs around and beyond the lone striker gives you more options in attack, especially when your wide players are coming deep, and Oscar is willing to track back. The problem becomes that Fabregas likes to roam and leaves spaces that the opposition can attack, which leaves Nemanja Matic having to cover for him. However, when Fabregas plays as a number 10 in favor of Ramires coming in for defensively solidity, the team becomes almost too defensive because Fabregas doesn’t make runs in support of the striker, instead looking to come deep to collect the ball and play from there. It leaves his striker isolate and really compresses the whole team defensively, and he makes it easier for a strong holding midfielder to mark him out of the game, like PSG did with David Luiz. Mourinho’s selection of midfielders will tell an awful lot as to what his approach is for this match. When Oscar and Fabregas play in the same side, this Chelsea team look much more dangerous in attack. But when one or the other plays, there’s just something missing from the team, and they tend to play much more defensively. Previous articleZlatan Ibrahimovic and Raheem Sterling to Chelsea?